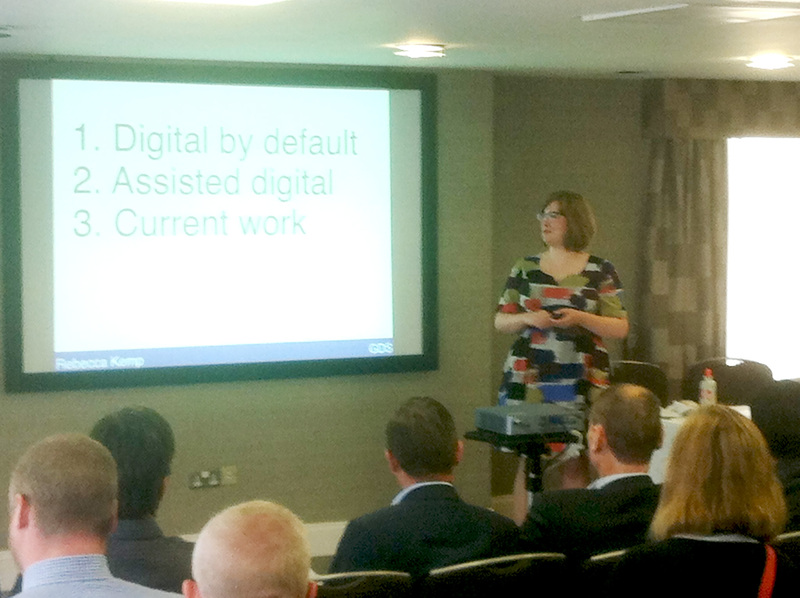 Last week we held our first 'market engagement' event for suppliers interested in providing assisted digital support for government services. It was really popular - so much so that we had to open another session so everyone who wanted to could attend. The structure of the event was simple: we gave an introduction to assisted digital, and then departments (Department for Transport, HM Revenue & Customs, Department for Work & Pensions and Department for Environment, Food and Rural Affairs) gave an early view of their requirements for assisted digital support (in other words, the types of support they might want to commission from suppliers). The Government Procurement Service (GPS) outlined the current commercial strategy - following on from the publication in May of a Prior Information Notice in the European Journal. All the materials from the event have now been published. We got some great contributions from the potential suppliers, and we’re really grateful to our colleagues from departments who presented and to the suppliers who came along. First, a shared commitment to meeting user needs. Many attendees asked about the user data and customer insight being developed by GDS and departments, and were keen to see that this was going to be fed into our requirements. There was a lot of discussion of how an element of learning can be built into assisted digital support to help build the confidence and skills of users, so that they could potentially use the digital service independently in future. We will be working closely with the new cross-government digital inclusion team on how assisted digital support and digital skills activity can have a greater impact when applied together. Second, how to make assisted digital consistent across government services. The discussion kept coming back to the point that - although we heard presentations from four departments about a number of their services - the people who'll need assisted digital support for these different services are the same people. We were really pleased to hear this because the assisted digital action in the Government Digital Strategy stresses the need for assisted digital provision to be consistent for users. Third - and related - was an interest in supporting multiple government services. In other words, rather than individual departments commissioning assisted digital support, people were keen to see a more collaborative cross-departmental approach. This suggests to us that by talking to potential suppliers together we're on the right track. But more importantly it's a great prompt for us to think about our requirements across government, and then to find the most appropriate commercial model to meet them. Bearing these three things in mind we’ll continue to define our requirements across government for assisted digital services (based on users needs, of course). We’ll continue an open dialogue so keep an eye on the Government Procurement Service page for assisted digital if you would like to be involved. I would support the idea that Users come first - whether I have an on-line transaction with DEFRA, HMRC, DWP, a charity, a school or the NHS, I am the same individual. people were keen to see a more collaborative cross-departmental approach. Going further, I may also live in Penzance, Cardiff or Falkirk and I will wish to use my digital skills to access Local Government. There are different tiers of government, but again I remain the same individual. If I can learn the skills at a convenient, local place then I can interact with everyone from my mobile or my sofa via a PC or tablet later. Having to do the same thing over and over again is not an outcome that people want from AD. That is what happens now and it is dis-empowering. So please remain committed to service design, user led design and focus on the user, the individual and their needs.